The most beautiful love poem ever written is contained in the Song of Solomon, the words of love written for his beloved. In it, he calls himself the rose of Sharon, a flower dear to his heart. In this beautiful song, Solomon writes that God loves us and His love does not change. He also points out that we do not always return His love and don’t always want to obey Him. Yet in the end, when we have learned to trust Him and obey Him, we find that His love trumps all. 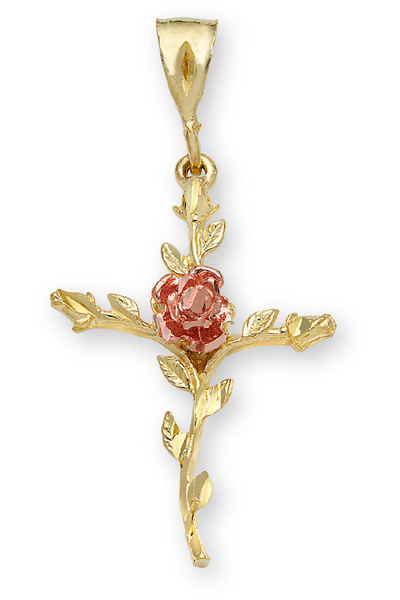 Our beautiful Rose of Sharon Cross Pendant in 14K Gold features a rose gold rose in the center of a cross fashioned from leaves, like the lovely flower of its name. The gently curving branches form a cross with upturned leaves, following the sun as we indeed follow the Son. The rose in the center symbolizes His perfect love at the exact center, where our love for Him should always remain. The solid gold pendant includes a graceful bale that will accept a gold chain from our collection of Gold Pendant Chains (not included). A perfect gift for the season of Passover and Easter for one you love! When you say your vows and place a wedding ring on your beloved’s finger, you are entering a phase of your life in which the promise of tomorrow shines forth like the brilliant white gold of this exquisite wedding band. In addition of being a token of a life that will be shared with your spouse, our Floral Vineyard Wedding Band symbolizes the flowering of love and the promise of fruit that is to come. As in nature, the flowering always precedes the bearing of fruit, and starting your life together with a symbol of continuing flowering means that you intend continual fruitfulness together. 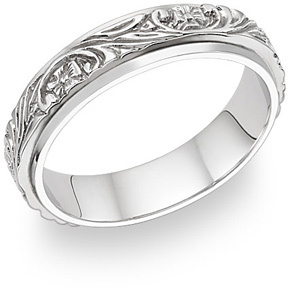 The beautifully designed flowers and leaves in the motif of this wedding band are carved into the 14k white gold and are bound by two smooth, shining edges of polished gold. It is crafted with our Signature Comfort Fit design that means it will fit and feel fabulous. Part of our collection of Flower Jewelry. As King Solomon compared his love to a lily among the thorns, so you also declare your own love the most beautiful of all women as you place this gorgeous Vintage Floral Wedding Band Ring on her finger and promise her your love forever. The impeccable crafting of the tiny lilies that encircle her finger will be a statement of how you view her, impeccably created by God. Each tiny flower is presented in its own space, separated by a line of solid gold beading that shows the individuality of each blossom. Behind the flowers is a darker background that works to made each one stand out beautifully. Dual migraine lines also border the edges to make a delicious frame for the little blooms. The Victorian design is simply charming! 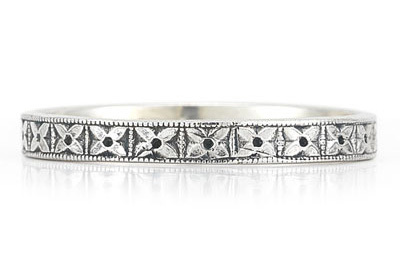 Also available as our Vintage Flower Wedding Band Ring in Sterling Silver, it is lovely on her right hand or in a stack as well. Once again we present the striking example of God’s love represented by the rose of Sharon. 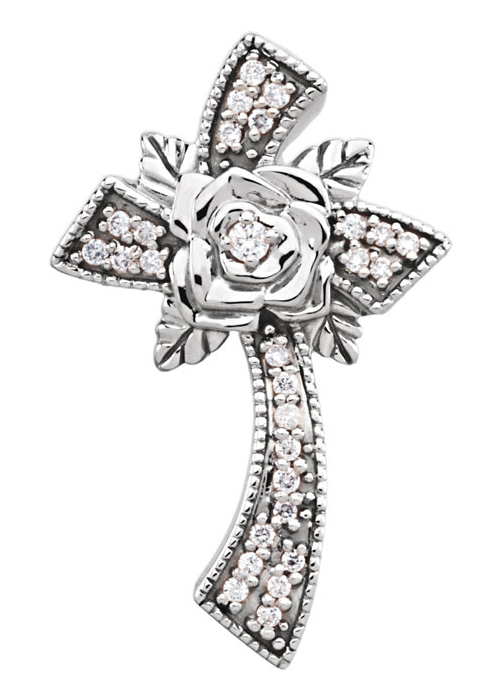 A stunning 14k white gold cross holds at its center a solid gold rose that cradles a round-cut white diamond in the middle. Four beautifully fashioned leaves flank the rose. A softly twisting cross seems to flow out of the flower center, exactly as God’s love flows to us from His heart. Milgraine edges line the cross and 28 white diamonds fill the arms, a perfect picture of the treasure that lies in the everlasting arms of God Himself. A hidden bale means that what is seen is the cross itself when it hangs on a chain from our collection of White Gold Chains for Pendants or on one you already own. It is an ideal gift to celebrate Easter, Passover, or spring!